That is what we need. An official Apple Deadpool case. I have a good quality non-Apple leather portfolio case. I love how it looks, feels in my hand, and how easily it goes in and out of my pocket. However, my leather portfolio case makes taking photos more awkward and for some reason the leather case causes the iPhone’s screen to fog over with splotches when I place the phone w/case in my pocket. The splotches wipe away easily with a microfiber cloth but it’s annoying nonetheless. I periodically switch cases but the annoying aspects of the leather portfolio keep it out of the rotation longer than my other cases. 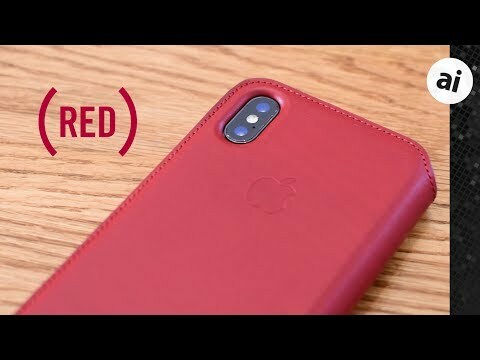 Anyone with similar experiences with Apple’s leather portfolio case? I can see that being an issue. I don't see that with Apple's. What I actually like about folio cases when it comes to photos, is it actually acts as a sort of hood. I use the volume button as the shutter, and the front flap of the folio keeps the glare off my screen in the sun! I have been using the black folio since day one and so far no issues whatsoever, including the one you described above. BTW, I don't put anything in its pockets though. And the only reason I am using folio case is to protect the screen and earpiece speaker from lint, dust, etc when in my pocket or in car and it serves the purpose very well. Not to mentioned it protected my iPhone X from 3 falls, and all three falls were similar (while stepping out of my very high SUV). I normally clean it with microfibre cloth that is slightly damped in distilled water. I am reluctant to use any chemicals though. It is really nice and Red is my favourite colour but the price is a big no for me. I don't find this Red one that appealing, but I'm sure it is a finely made piece of work. I had a tan Apple Leather Case for my iPhone 6 Plus. It is a very nicely made case. Having said that, after I got the Jet Black iPhone, I started opting for transparent cases. I find them to be a good compromise on showing off the beauty of the iPhones and protecting it from my clumsy hands. I'm not the kind of guy who'd be able to handle an iPhone without the case. Beautiful, but at $99, it's a plain NO for me.